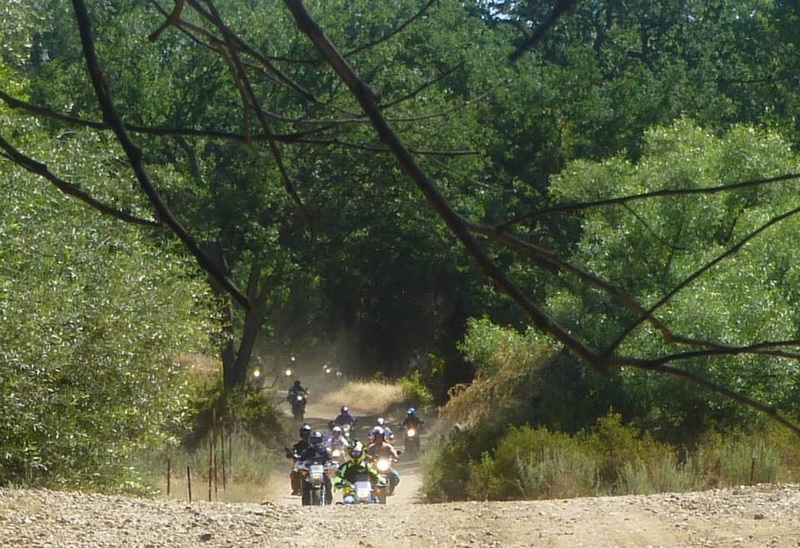 Well, we had our 2nd Annual Russ Austin Memorial ride in Santa Margarita Lake, CA and once again it was a success. For those of you has been following my blog for a while, may remember that the last year event was a bittersweet experience for me. It was a joyous event in remembering all of the good times we had but also a painful reminder that he is not here anymore. Just like one of the cliché expression that I don’t like says “time heals all wound”, the wound was still there but it was easier to deal with the emptiness of his presence. We had the same amount of TW200 riders as last year but with new faces than last year. We had several rides come from out-of-state, such as Washington, Nevada and Arizona. Also, we had a couple of women riders this year which I’m always excited about! It is nice not to be the only girl in the group. Just like last year, everyone arrived on Friday, even me. Actually, I made it up a day early but stayed overnight in Morro Bay, CA to visit with my sister-in-law. As usual, our wonderful camp host, Mel, provided us with the meals all three days. He loves providing us with a central place for chow so we would have more times among with each other than everyone retreating back to their tent or cabin during meal times. Since, the beach ride last year was a huge hit, we did it again. We rode up through Hi Mountain Road starting from Pozo and ending up in Arroyo Grande. It’s a 34 mile fire road through the Los Padres Forest. It is classified as an easy trail but there seems to be more ruts in it than last year. At one point on the trail, there was a broken down truck which amazingly our chase vehicle narrowly squeezed by. The chase vehicle was driven by my son’s girlfriend which was loaded with many of the guy’s significance others who wanted to tag along for the ride. All of the wives gave her high praises for her skilled driving. On day two of the event, I took one of the guy’s wife who is a beginner for a private ride to help her gain confidence in own riding skills while the guys went on a ride looking for the Pozo mine. I don’t think they ever found it but still had fun exploring the various roads in Pozo. I had a blast riding with her, it actually brought back many memories of the days I was learning to ride while Russ patiently riding behind me. It is so nerve wrecking having someone we love watching us as we learn how to ride. It sometimes become unproductive because we’re so self-conscious of trying not to make a mistake and we end up making more mistakes than normal. Most of everyone left on Sunday night except for the usual hard-core SoCal TW200 riders, we stayed the night. 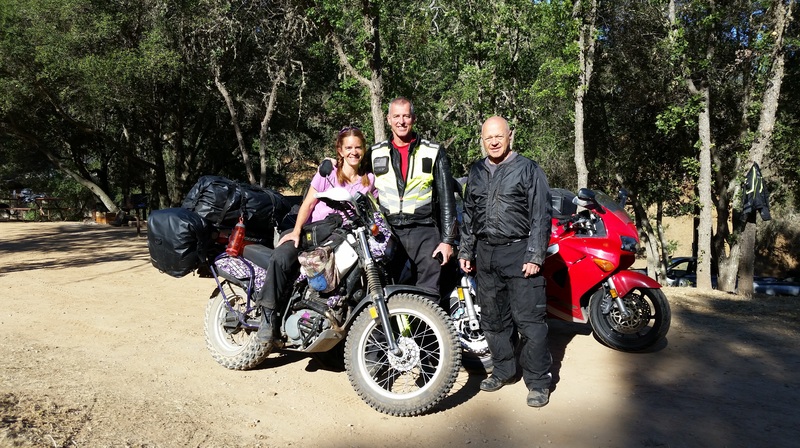 As we sat around the campfire, we noticed two motorcycle riding into camp trying to find an empty site to camp. So, we offered to share our site with them. They were best friends, one live in Oregon and the other one in Colorado who meet up once a year and ride around. 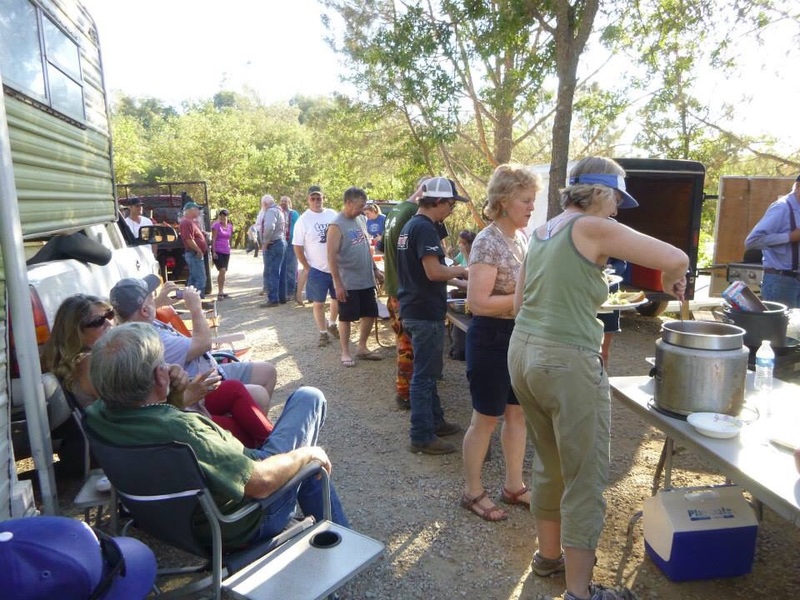 They were ever so grateful for our hospitality and as usual, our camp host, Mel, ran off to dished up a warm meal for our guests. All in all, it was an awesome weekend with old and new friends sharing our passion for motorcycles. As I said last year, “remember that life is too short and cherish the times you have with your friends, family and loves one. You’ll never know when you might go home to an empty house”. As for me, the open road is now my home and my heart is not empty anymore since he is riding with me in spirit. Love those nobbley tires and your optimistic mantra! Thank you and I’m loving riding this baby on this journey!